Dubai, UAE, October 27, 2018 - Software AG, the global, independent software company with a focus on innovation for the digital age, concluded its participation at GITEX Technology Week 2018 on a high note, with the signing of two Memorandums of Understanding - one with the UAE Ministry of Interior and the other with Rochester Institute of Technology (RIT) - among the highlights of this year’s participation. Besides, Software AG’s stand, located at B7-20, Hall 7, witnessed high footfall, as the top executives successfully engaged visitors from a multitude of sectors by drawing attention to its rich portfolio of solutions that include Smart City IoT, agile process automation, government service visibility platform, digital twin, API, integration and more. 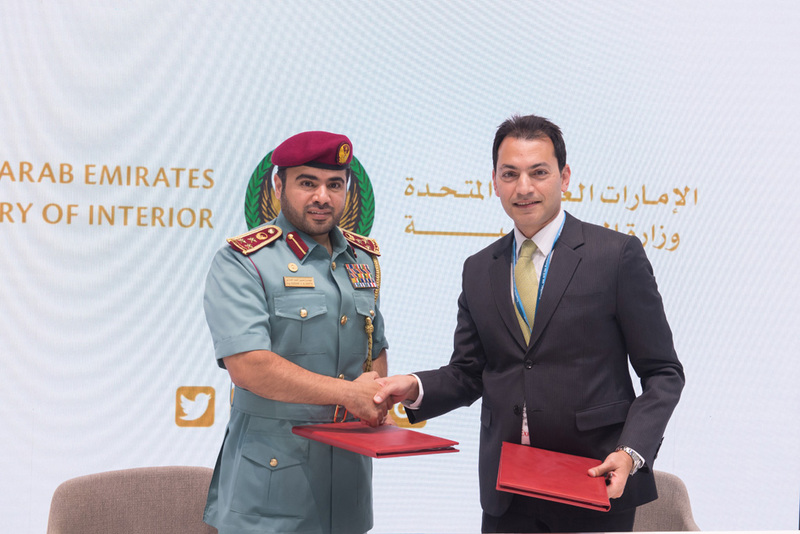 The MoU between the UAE Ministry of Interior and Software AG was signed on the second day of GITEX 2018 by HE Brigadier Eng. Hussein Al Harthi, Director General of Electronic Services at the UAE Ministry of Interior; and Rami Kichli, Vice President Software AG, Gulf & Levant. The company was selected by the Ministry for the development and establishment of practices of Enterprise Architecture, Artificial Intelligence and Internet of Things (IoT), to drive digitization efforts. Under the terms of the MoU with RIT Dubai, which was signed on day 3 of the exhibition, Software AG will provide its expertise for the development of a digital transformation lab at the Institute, by harnessing the potential of its Digital and Business Platform (DBP). In addition, the company will develop professional training programs in digital transformation and will jointly explore potential collaboration with RIT Dubai, to support Dubai government entities and their vision by collaborating on latest trends in IoT and other services innovation platforms, among others. The MoU was signed by Dr. Yousef Al-Assaf, President, Rochester Institute of Technology; and Rami Kichli, Vice President Software AG Gulf & Levant. High-profile visitors to Software AG’s stand at this year’s GITEX Technology Week included HE Major General Obaid B Suroor, Deputy Director General of GDRFA; Mohamed Al Hammadi, CEO, ENEC; Mohammed Shael Alsaadi, CEO, DED Dubai; Ahmad AlMahri, Assistant Secretary General, TEC; as well as executive delegations from RTA, Ministry of Education, Emirates Transport, among others. Innovative products and smart solutions showcased by the company at the exhibition included the digital business platform, Cumulocity IoT and cloud solutions, under the theme #EXPERIENCEEVERYTHING. The visitors to Software AG stand had chance to watch showcases during GITEX. In smart city showcase, a demo of trash cans highlighted various ways in which technology is turning cities smarter with intelligent trash cans and connected streetlights. At GITEX 2018, the visitors also got to learn about the possibilities of API-enabled municipal services and upgradation of waste management services using smart bin sensors and mobile portals. The unique features of these systems include a smooth payment process through a shared billing service provider and alerts on the status of burnt-out street lights, among many others. By offering easy monitoring and real-time tracking of data, these solutions provide local governments with great levels of control over various systems and processes. In addition to smarter city, supply chain showcase, smarter goods, Software AG showed how to track & trace the goods. Within the Cumulocity IoT platform, user of this demo can see how to move goods over challenging terrains while using embedded sensors to monitor accelerations, temperature and humidity, loading and delivery. How Machine and Manpower move hand in hand to facilitate Enterprise Empowerment?